As London gets more and more expensive developers and end users are looking for more bedrooms and more space. More bedrooms tends to mean a property is more valuable. 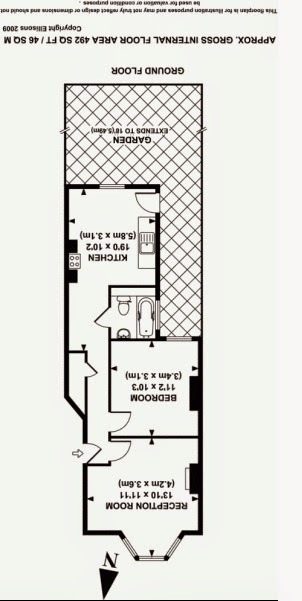 Now this isn't a license to take a carving knife to a floorplan and make the rooms only big enough for a single bed and floor space to put your slippers at night. There is of course a limit to how far you can go. But this limit has changed over time. I'll take three examples, one purpose-built flat and two Victorian conversions to show you what is possible with very little investment. Perhaps moving a kitchen and putting up a stud wall. Ground floors often cost a little more though as they involve an extension. See what was done there? move the kitchen into the living room and VOILA - a 2bed. 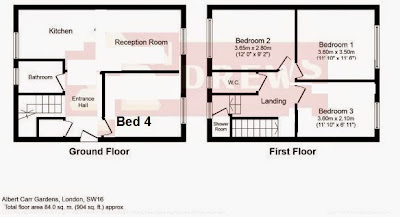 You'll notice the one on the right goes in a bit at the side, that's only because there's another flat on top, Proving the point even more - the developer even converted the loft into a separate flat. Another good angle! Example 2: You can actually do this with a bit more work to a ground floor flat but that involves an extension. I've included 2 "after shots" because one is particularly better than the other, the last one has a side return filled in which gives even more space (and it's silly not to do it really, minimal cost). So what about purpose-built flats? You can hardly extend a purpose-built block can you (well believe me when I say I've seen it done, don't ask re consents!!)?!? Here is "le grand truc:"
So there we have it, I hope that's been interesting. But to come back to the original point - does it add value? Yes and no is the answer. You will get more rent, that's for sure; you will get a better sale price, that's for sure. But within reason. If the flat is too small to start with there is no hope - it still needs "reasonably sized" rooms. Now "reasonable" changes over time, reasonable becomes smaller as gentrification takes hold. 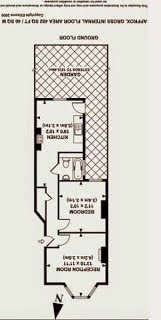 Whereas years gone by 500sqft was acceptable for a 1bed it is now not uncommon to see 2beds with that square footage. All of the examples I used are fairly run of the mill, there are much more creative and compromising ones out there. Adding value can be done best my maximising space, and then you are talking loft conversions or filling in side returns. If you just move stud walls around you will get a return on your investment that's for sure (more rooms means more rent), but unless the place is a wreck and you're adding value anyway by refurbishing it there is little scope for a profit in the short term. Those work best as hold and rent investments because you will be able to remortgage and release capital in 2 years or whenever your mortgage deal comes to an end. 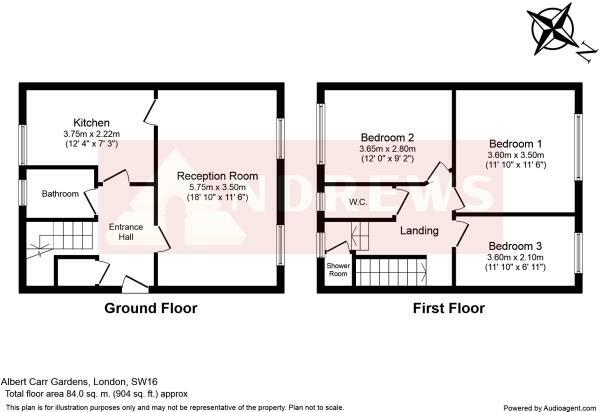 and this one in the same estate is being sold as a 2bed but I have a sneaking suspicion that it was a 1bed before, the council didn't build open-plan kitchens back in the day! A 1bed in that block sold for 266k (no internal photos so presumably a wreck) http://www.rightmove.co.uk/house-prices/detailMatching.html?prop=24800750&sale=53566832&country=england - perhaps it's the same one? No way to tell, really, but not unlikely! So if you are prepared to spend 30k doing it up that makes a tidy profit! 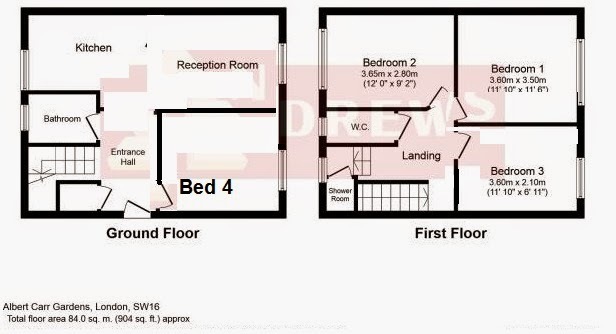 So you can see first hand examples of someone buying a 1bed, turning it into a 2bed and charging a premium for their work. Which I endorse of course because it's entrepreneurial! I'd do the same quite frankly. In this example 266 plus perhaps 30-40k in costs means a yield of around 6%, so it could do well as a hold and rent if it's not sold around 350-360k to give a short term profit of 50-60k. Brilliant strategy, brilliant exit plan - doesn't sell? Let. I'm off to find the next deal. If you fancy talking property give me a call on 020 3397 2099 for a chat or drop me a line on: jeroen@xandermatthew.com – I'm always on hand to answer any property related questions. * Naturally I don't want to infringe copyrights and the such, the floor plans used in this article are freely available online and I don't want to pass them off on my own. All the relevant owners' markings have therefore been left on there as not to allow anyone to think otherwise.